I ME MINE is the closest we have come to George Harrison's autobiography. To mark 40 years of Genesis, I ME MINE - The Extended Edition has been significantly updated since the 1980 original, covering for the first time the full span of George Harrison's life and work, exploring his upbringing in Liverpool, the growth of Beatlemania, his love of India, gardening and racing cars. I ME MINE presents 141 of George Harrison's songs, featuring handwritten lyrics with facsimile reproductions, accompanied by his uniquely intimate and humorous commentary. This expanded volume includes a further 59 lyrics written for The Beatles and Harrison's solo albums - from All Things Must Pass to Brainwashed. 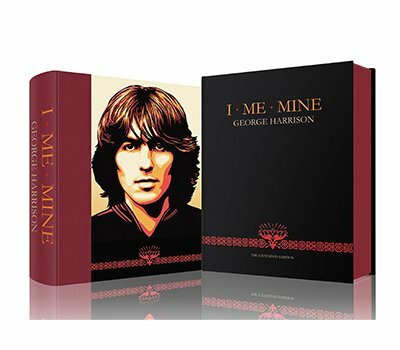 With written contributions from Olivia Harrison and Derek Taylor, original cover art by Shepard Fairey, and a wealth of previously unpublished material, I ME MINE - The Extended Edition, is a treasured portrait of George Harrison and his music. Released as a trade edition worldwide this Autumn, for Genesis subscribers we have also created 1,000 limited edition numbered and estate-stamped vinyl boxed sets. To find out more about I ME MINE - The Extended Edition, click here.